FFFA fire extinguisher systems have to be maintenanced every two years according to FIA standards. At our maintenance service the extinguisher will be test fired, the handle will be dismantled and all parts of the bottle will be chekked for any damage or faults and cleaned. Then the extinguisher will be filled with new FFFA liquid and pressurised. Every bottle we have serviced will be followed by a service report that shows everything that has been done for the bottle, in which condition the different parts of the bottle are and if any parts needed to be replaced during the maintenance. Fire extinguishers can be delivered to our HQ in Rantsila. And we also do maintenance services on track sites during races if necessary. 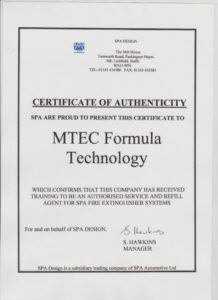 At the moment we only service SPA Design Fire Extinguishers but more brands will follow.